It's always nice when people contribute to your articles through comments or by resharing it with their mates. That said, I'm happy to announce that Philippe Poumaroux translated this article into French. So, if you're interested, you can find it here. Creating a web server is as simple as these couple of lines of code. One of the great things about node is its enourmous community which creates and publishes so-called node modules on the NPM directory, Node's package manager. Currently there are about ~90.000 modules and there have been around ~390.000 downloads last month. More on nodejs.org and npmjs.org. 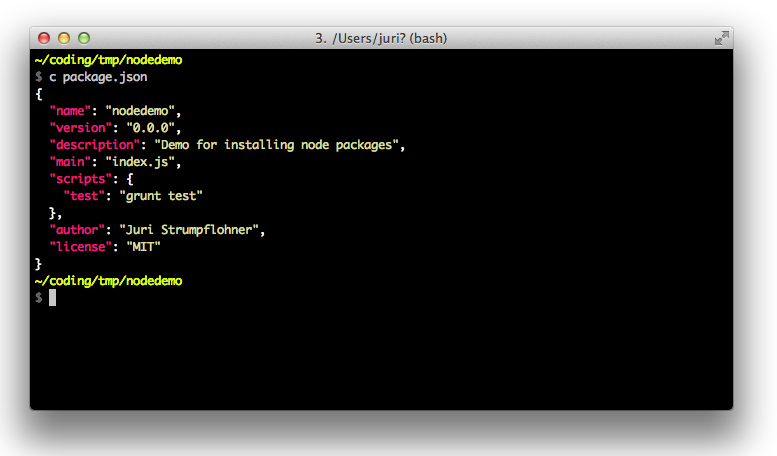 So, to get started, you have to first install the Node runtime. The best way to do so is to download the desired package from the official site. This will also automatically install NPM on your machine. ..into your terminal should output the installed version of node and thus confirm you're ready to go. This installs the grunt node package into a folder called node_modules. The best practices approach though is to create a package.json file. Since the suggested approach is to not commit the content of your node_modules folder to your VCS, but rather to automatically reinstall them during the build process, you need a place to keep track about the installed package and its according version: package.json. To create a new package.json file, simply execute npm init inside a clean folder. You'll have to answer a few questions but ultimately you will get a nice new package config file. Similarly, if you add --save it'll be added to the dependencies section. The difference is mainly that dependencies are actively used by your appliation and should be deployed together with it. On the other side, devDependencies are tools you use during the development of the application, which normally do not require to be deployed together with it. 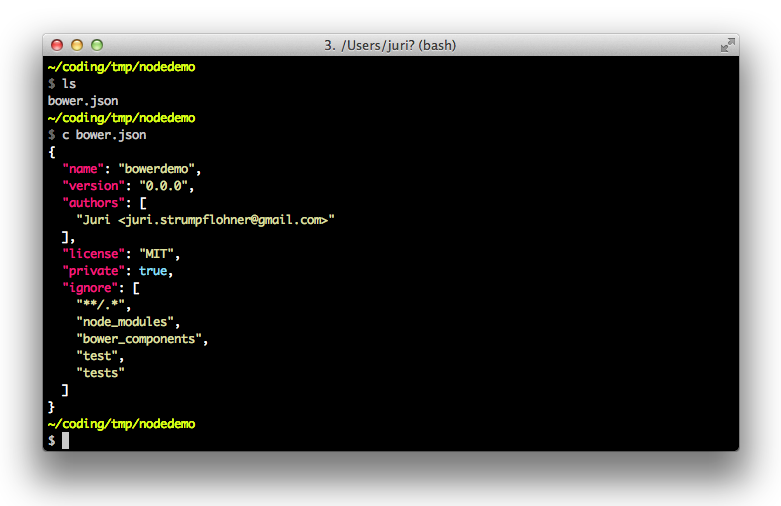 Examples are code minifier scripts, test runners etc. To uninstall a package, use..
..which uninstalls grunt and removes it from package.json. As I mentioned, you normally don't commit the node_modules folder to your VCS. Thus, when a you as a developer, or the buildserver retrieves the source code from your VCS, somehow, the packages need to be restored. This is where the package.json file comes into play again. By having it in the root directory, executing..
..instructs NPM to read the dependencies in the config file and to restore them using the specified version. NPM packages use Semantic Versioning. tells npm to use exactly this given version of the package (most restrictive). tells npm to only upgrade the given package for increments of the patch version (normally just bugfixes). NPM defines it as ~1.3.5 := >=1.3.5-0 <1.4.0-0. tells npm it can upgrade to any version smaller than the next major release: <2.0.0. This is the new default behavior when you install node packages (before it was ~). NPM defines it as 1.3.5 := >=1.3.5-0 <2.0.0-0. tells npm to always update to the latest version (not recommended). Bower is to the web browser what NPM is to Node.js. It is a package manager for your front-end development libraries like jQuery, Bootstrap and so on. Then, similarly as you did with NPM, you execute bower init on your terminal to create a new bower.json configuration file (the equivalent of package.json for NPM). Installing packages is identical to NPM. You can also download a specific version by appending jquery#1.9.1. Note, the --save (or -S) option adds the dependency to your bower.json config file. Installed packages will be placed in the bower_components directory. It is suggested to not commit that one to your VCS (just as with the node_modules directory). What's particularly interesting is that Bower allows you to install packages from any git repository or even a plain URL. If you require some more advanced configuration, like changing the name of the dependencies directory or its location, you may want to use a .bowerrc configuration file placed at the root of your project directory structure. More about the available configuration options can be found at the official site. There's another nice article I found on Medium that gives a quick introduction to Bower which you might want to take a look at as well. Yeoman is build around generators which are either developed by the Yeoman team official generators or by the open source community. Yeoman itself basically just provides the infrastructure for building and running those generators. that you can quickly get up to speed. Creating a project setup with proper tools and dev support can cost you lots of time and requires expert knowledge. that you don't necessarly have to know all the best practices tools that are currently available on the market. Yeoman assembles them for you, s.t. you can get started immediately. Then once you get more expertise, you can adjust Yeoman's configuration to make it fit even more to your project needs. a great way for you to learn lots and lots of new tools. Then find your generator (i.e. for angular) and install it using the following command. Finally, execute the generator within your project directory to create a new app. This will create the initial scaffold from which you can then start building your application. But Yeoman goes even further, based on the generator you use, you may also generate single components, like Angular controllers, directives etc. while you develop. That's all regarding Yeoman's usage. More advanced topics are about creating your own custom generators. Simply study the docs as they're quite detailed. Another good presentation is the one by "Cowboy" Ben Alman Bocoup about The State of Grunt (Aug 2014). The reason for having two components is to make sure we can run different grunt versions side-by-side (i.e. legacy versions in older projects). Hence, grunt-cli is installed globally while grunt is installed on a per-project basis. The grunt object is Grunt's API: http://gruntjs.com/api/grunt. It allows you to interact with Grunt, to register your tasks and adjust its configuration. Grunt modules are distributed through Node's NPM directory. Normally, they are prefixed with grunt- and official grunt plugins are prefixed with grunt-contrib. Example: grunt-contrib-uglify. Hence, Grunt modules are node modules and thus you install them just as I've shown before. You normally start by defining the build tasks like this example of a stringCheck task taken from the Grunt book I mentioned before. As you can see, a task is simply a function that you register with Grunt. Note, externally downloaded tasks through NPM have to be loaded first, in order to be used in your Gruntfile.js. This is done by using the loadNpmTasks on the grunt object. In order not having to do this for every single task you use (which can be quite a lot), you may want to use the load-grunt-tasks plugin and execute require('load-grunt-tasks')(grunt) at the beginning of your Gruntfile.js. This will autoload all grunt modules, ready to be used. You can then execute them with grunt stringCheck:target1 and runt stringCheck:target2. target1 and target2 can (and should) obviously be named differently. All most people need to know is that foo/*.js will match all files ending with .js in the foo/ subdirectory, but foo/**/*.js will match all files ending with .js in the foo/subdirectory and all of its subdirectories. Since most of the tasks ultimately interact with the file system, Grunt already predisposes a structure to make task devs' life easier. If a globbing expession is specified, Grunt tries to match it against the file system and places all matches in the this.files array within your Grunt task function. It is also possible to define multiple source sets with according destination. For this purpose the files array is used. The expand property tells Grunt to generate a corresponding destination for each matched file. cwd stands for the current working directory, src and dest are self explanatory and ext is the extension to be used for the destination files. More options can be found in the official docs. Ultimately your goal is to execute the Grunt tasks you defined. 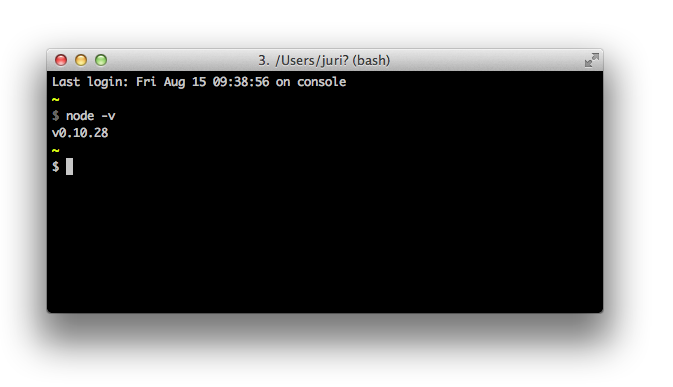 If you remember, you previously installed the grunt-cli tool globally which you can now use to run a task. If you have a multitarget task, then use : to specify it. I didn't study it in detail yet, but you should definitely keep an eye on it as it is fastly growing and gaining in popularity. For now I won't include more details, but I definitely will update this article once I've taken a closer look at it.